It’s the first of September, and once again, the Arcade is open in Second Life. It’s been five years now, and it’s still going strong! I was in the first Arcade, and I’ve been in lots of them (but not all) since. 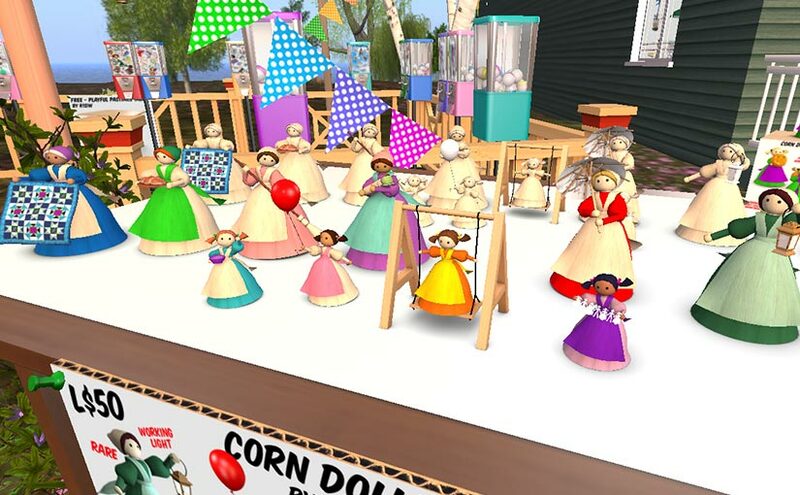 I’m there again this time, with a bunch of Corn Dollies. It’s all Marianne McCann’s fault. She was the one who begged for them. I was going to do this set a long time ago, and then got distracted, and only did one. I put that one in an Arcade set called Grandma’s Attic, which was really a whole lot of things that I had sitting around in my workroom, but had never really finished, or finished and never put up for sale. I have a lot of things like that, at any time. But Mari never forgets, especially when it’s something she really wants, and so she kept nudging until I got this set done. If you like them, thank her! There are 12 in the set, plus the reward. Many of them are scripted; for instance, there’s one with a quilt, which lets you swap between 3 different quilt patterns. There’s one with a parasol, that lets you choose from 12 different parasol designs. There’s one holding a bird, that plays birdsong when you touch her, until you touch her again. There’s one with a working lantern that has all kinds of different options. There’s one with a bubble wand, that lets you toggle the bubbles on and off. There’s one on a swing that can really swing. 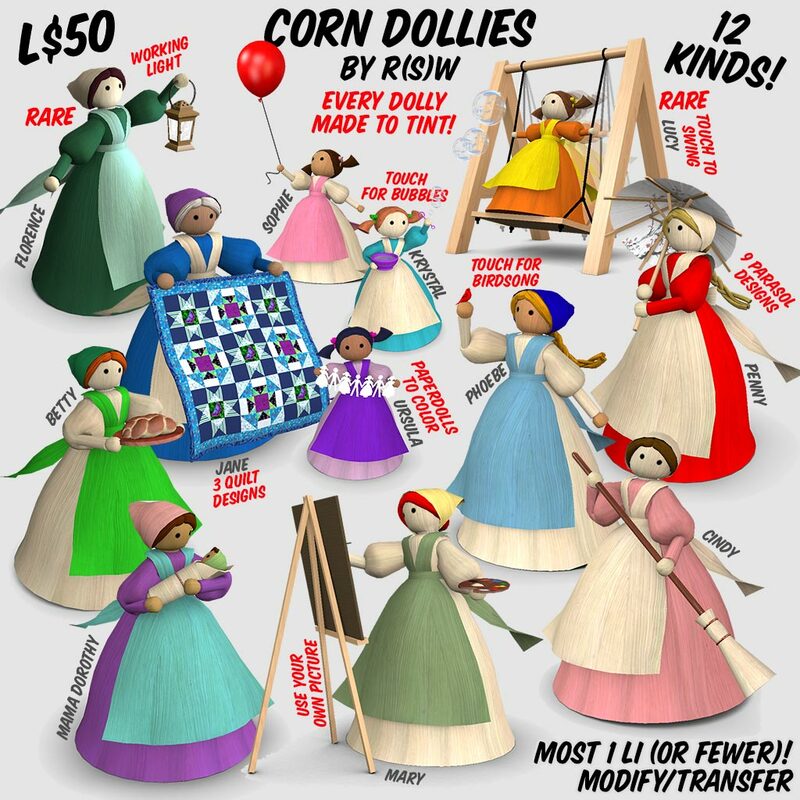 All of them let you change the colors of their skin, hair, apron, dress, and kerchief (or hair bows) separately, so you can have them look just the way you want. You can also use your own pictures for the one with the quilt, or the one who is painting, just by dragging them over the quilt or picture that’s there. 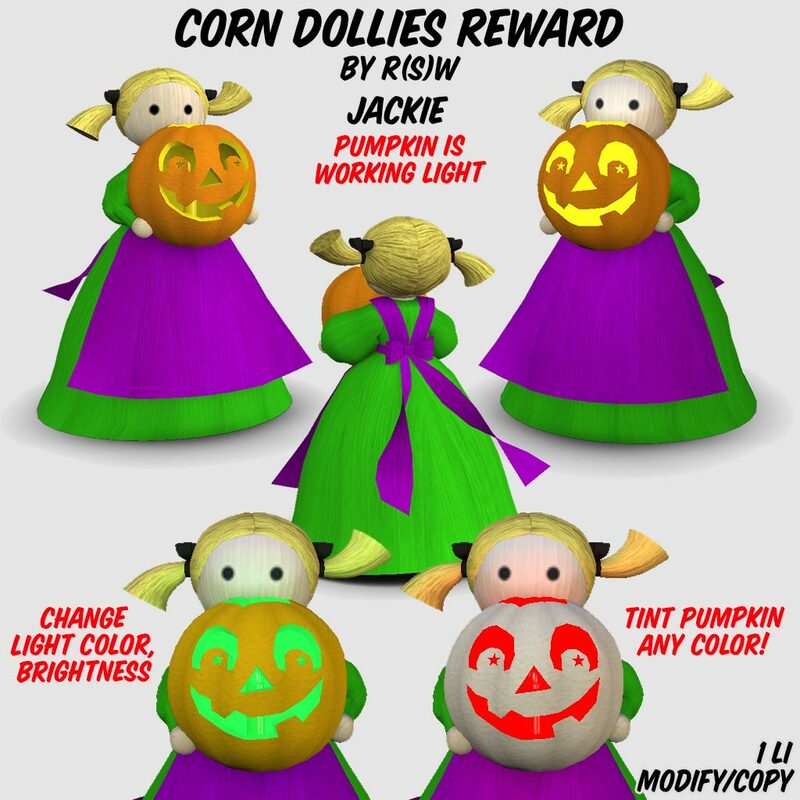 The Reward is only available during the Arcade, and is copy/mod, no transfer, so you won’t be able to pick her up at any of the sales or trades. This is your only chance to get her, and only by playing the machine 25 times. She’s holding a jack-o-lantern that’s really a light, with all the options (including changing the light color and brightness.) It’s a bit early for Halloween, but it won’t be by the time the Arcade closes on September 31. The Reward you get for 25 plays! While you are there, don’t forget to pick up the Birthday Presents! You’ll find them on the huge cake in the middle of the venue. Happy Birthday, Arcade! The Arcade September 2016 Round is Open! It’s that time again, and The Arcade is open for the September round. If you’re a resident of Second Life, you can visit our Gacha Machine at The Arcade, and try your luck! It’s just L$50 a try, and everything is mod/transfer. The sliding puzzles scramble or solve themselves with a touch. If you wear the plane, your avatar holds it up in the air. If you touch it, you get a really cute kid voice making a plane noise, so you can run around pretending the plane is flying. The ray gun water pistol is the most fun! If you wear it and go into Mouse Look, you can shoot a cascade of water at your friends! The disks on the front of the gun also light up and spin when you’re in Mouselook, so everyone knows you are ready to douse them at a moment’s notice. 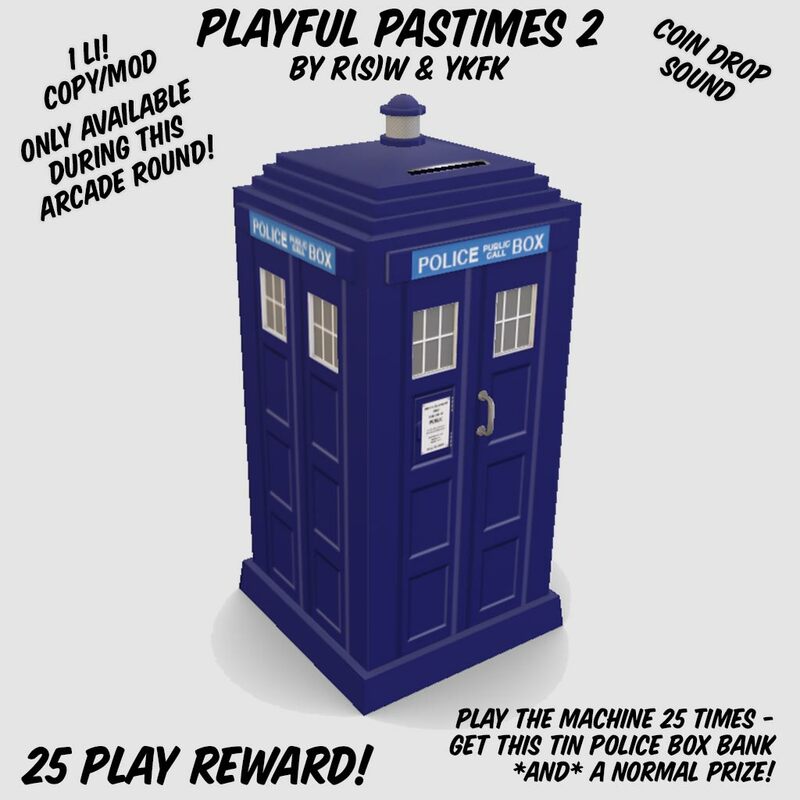 If you play the machine 25 times, you get a special Reward; a tin Police Box Bank. There’s no other way to get it, and it’s only available during this round of the Arcade, so if you want one, you have until September 30. Unlike all the rest of the things in the machine, the bank is copy/mod, so you won’t be able to buy, beg, or borrow one from anyone. When you touch the bank, you’ll be able to hear the coins dropping into it. There’s also a script in the Instructions (in the Object Contents) that lets you turn it into a tip jar, if you want to. So that’s part of what I’ve been up to! 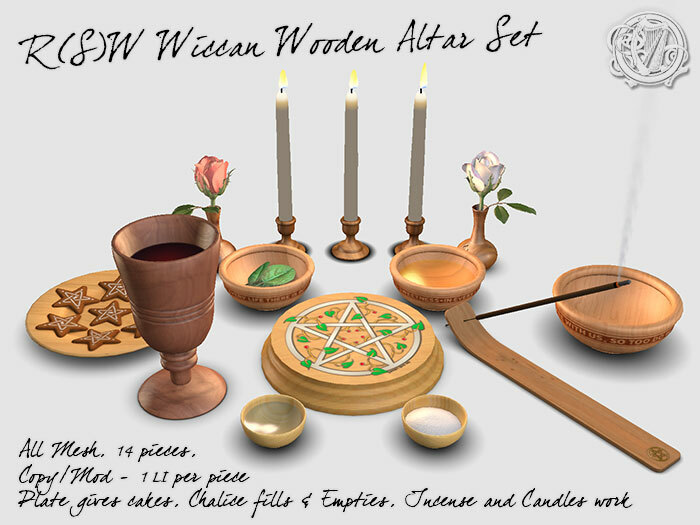 Hope you enjoy it, and if you’re in Second Life, I hope to see you there! Posted on September 1, 2016 Categories News, Second LifeTags Arcade, Gacha, Second Life, SLLeave a comment on The Arcade September 2016 Round is Open! I just put a new story up on my Patreon page, for those people who subscribe at $5 a month or more. The story is from a collection that I’m tentatively calling The Dreamweaver’s Tales. Here’s the introduction for the collection. Long ago, in the Before Time, our arm of the galaxy twirled through a spoke of the Cosmos that was filled with Enchantment. In those days, all the world was thick with Magic, and fantastical creatures roamed land and sea, bringing joy or terror, according to their natures. There were many kingdoms then that have since fallen to dust, and even the ever-so-very-great grandchildren of the ancient Kings and Queens no longer remember their names. You might be one, all unknowing. In one of those kingdoms there was a mighty city, with walls and towers of shining alabaster that blazed white in the sun. Many-hued banners snapped in the breeze at the tops of the towers, and the air was filled with the perfume of a thousand flowers. There was a bustling marketplace there, where hundreds of merchants hawked their wares under colorful canopies. There were rows of booths filled with amazing fabrics, shimmering in the sunlight. There were hidden nooks where mysterious figures shrouded in robes stiff with mystical embroidery sold jeweled treasures glimmering with magic. There were pens and cages filled with animals from every corner of the globe, from small crested dragons no bigger than your thumb to towering, tusked creatures that were armored for war. There were sections filled with a thousand musical instruments, all inlaid woods and gleaming strings. There were whole squares given to selling foods from plain bread rolls to the most exotic spiced confections you can think of. Picture the rows of booths, each with its bright awning to shade the buyers and sellers. 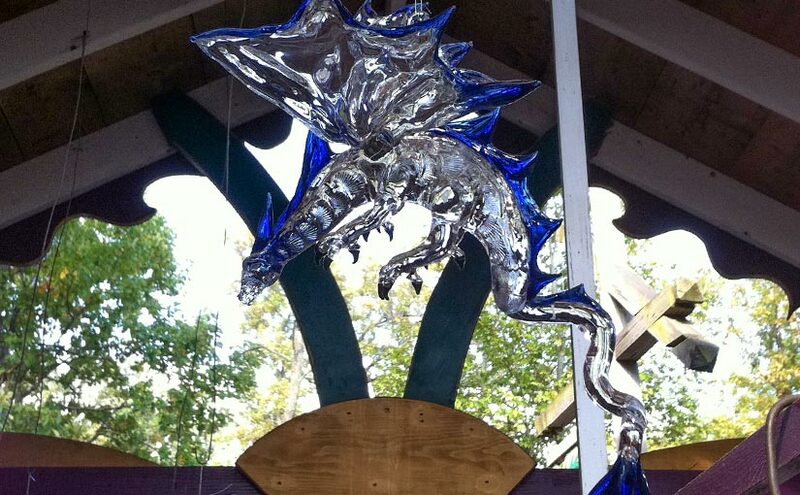 Picture the sunlight, dazzling as it reflects from polished wood, metal, and precious stones. Picture the sounds with your mind’s ear; the sweet notes of women singing of perfumes and baubles to entice customers. The harsh bellows of men outshouting each other in their attempt to engage the crowd. The calls of the livestock, the peals of metal chimes, the snatches of song played by wandering minstrels, the calls of the street performers, all mixed into a cacophony that somehow blends into a busy, harmonious whole. Picture the scents with your mind’s nose, perfume, and heat, the spicy musk of the wooly beasts, spices, rare woods, meltingly delicious desserts, and the cool fragrance of growing plants. Picture the crowds, dressed in clothing from all the world, feathers nodding in an elaborate head dress here, long sleeves flowing there. Bare feet, scarlet slippers, and tooled leather boots with curled toes all vying for space on the red porphyry pavement. Children in splendid finery, and children in little more than rags laughing and playing as they slipped through the crowds together. Let us follow two of them, a boy and a girl in plain homespun with just a touch of embroidery, as they race below the elbows of their elders. Together, they weave their way past the booth where an old, old woman is selling sweets dripping with honey. Past the fat, bearded old man with ranks of toys. Past the young woman with bunches of bright ribbons. Not even pausing for the flute player, or the puppets, or the man with a basket of silky-furred puppies. Down to the far corner of the market they run, to a nondescript tent of dusty brown, with a single silver star on a deep blue banner trailing down the side. Here they pause, catching their breath and each other’s hands. And then they lift the flap and slip inside. Inside, all the noise and light from the market are gone. Inside, it’s quiet and cool, and stars glimmer in the twilight. Inside, it’s outside, on a still hilltop, on a summer evening. There are other children here, and grown-ups, too, all sitting in a circle, watching a still figure draped in white. For a moment she remains motionless, as we settle in the circle with the others. Then she lifts her head, and smiles gently. Then she lifts her hands, and starlight and dream-stuff pour between them. She gathers it up, spins it into shimmering strands, and from the strands she weaves a visible dream. A dream of shifting colors and flowing shapes, of light and substance. Of pale shadows and strong sparks. A dream of Good and Evil. Of how our smallest choices can make huge differences. Of the warmth and courage of the human heart. This is a Dreamweaver, and these are some of her Dreams. If you want to read the first one now, instead of waiting for a month for it, you can support me on Patreon. There will be another story posted here tomorrow; it’s the next Kip Andrews. Those are written in a totally different style than the fairytales, like the Dreamweaver’s stories. You might like it better, or you might not. I’d love to hear one way or the other. 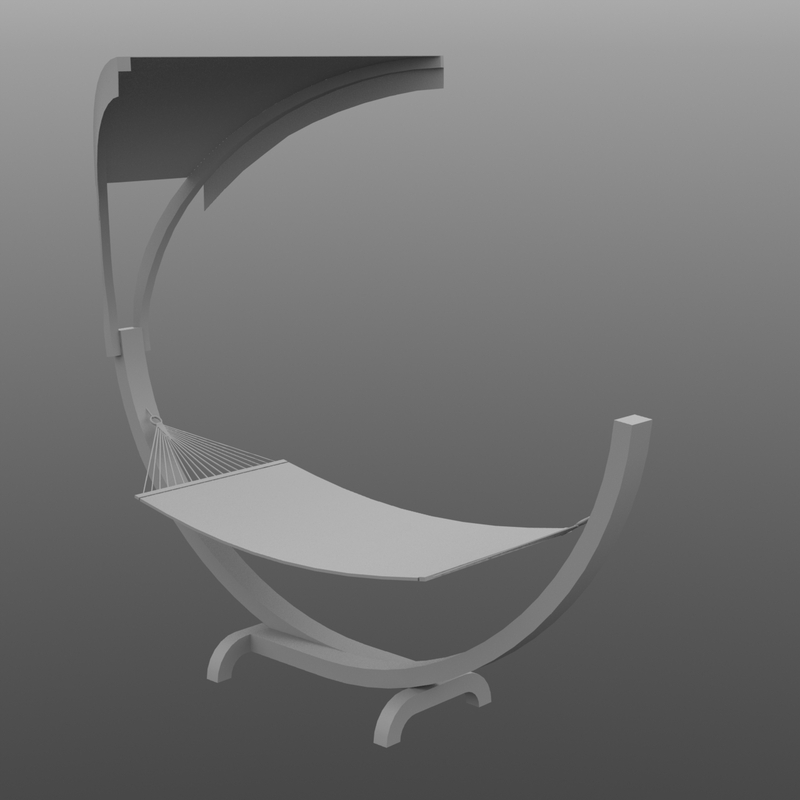 Finally, for people from Second Life, the mesh for the hammock that I showed yesterday is finished! The finished mesh for the hammock. 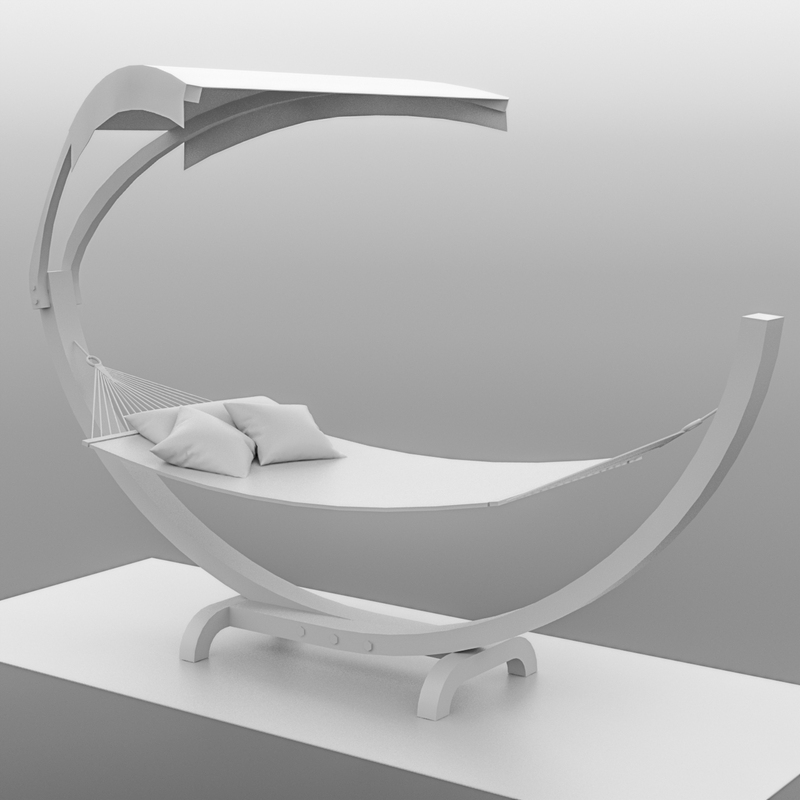 I still need to make all the textures, the LODs, bring it into SL, and assign animations and script it so the hammock will swing. So yeah, next week, at the earliest. In the meantime, I hope you all have a wonderful weekend, and I’ll see you tomorrow! 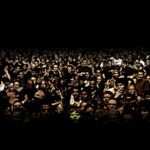 News – Second Life, Writing, and More! Sorry for vanishing like that! I got sick, and the medicine the doctor put me on made it really hard to focus or do much of anything. But I’m better now! I have been trying to get some stuff done while I was gone. 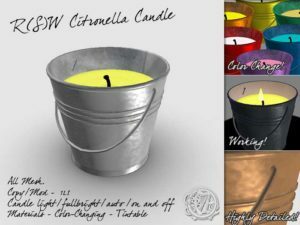 First off, I got a citronella candle out for Second Life. I’m pretty pleased with it. Like the res of my candles and lamps, it works (either Local Lights or Fulbright.) I don’t really see the point of a light that doesn’t light! 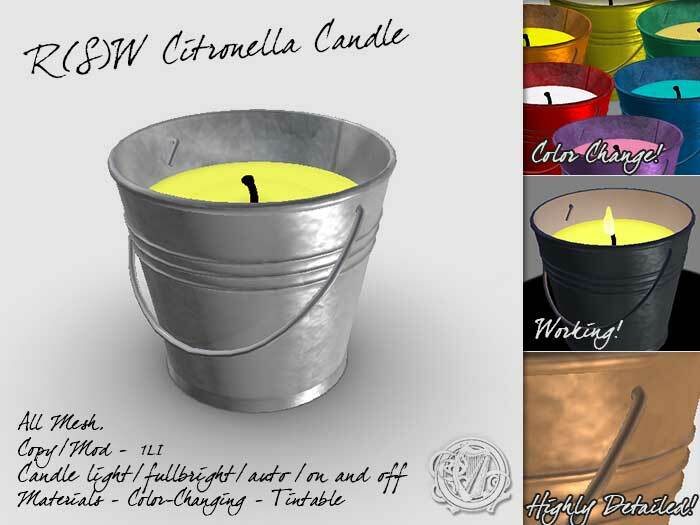 It’s also color changing; there’s a script to change the color of the candle or the bucket, although since it’s copy/mod you can also just change it all manually, if you prefer. If you would like to know more about it, you can see it in the SL Marketplace. 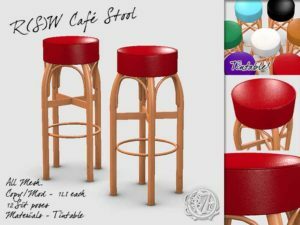 I also released a stool to go with the café table and chairs. That was week before last, but I had a story that I blogged that day, so I was going to wait to talk about this, and then I got sick. It has 12 sit poses, is also copy/mod, and you can find out all about it in The Marketplace as well. Speaking about SL, there are only two weeks left of The Arcade. As always, when it’s over you’ll be able to keep playing my machine on Livingtree; but you won’t be able to get the special Rewards for playing the machine 50 times ever again. So if you want those, you only have a couple of weeks to get them! There won’t be a new item out in Second Life this weekend, because the thing I’m working on right now is going to take me longer than that to finish. I think it’ll be worth the wait though. It will come in three parts; the hammock itself (I still need to make the pillows but they’re coming,) the stand, and the shade canopy. That’s so the hammock can swing. Swinging in the hammock is important! It also will mean that if you have trees, you don’t need to use the stand. And if you don’t want the canopy, you can save the LI and not have it. It will probably wind up tweaked a bit from what you see in the picture, and it needs textures and things, of course. It is, after all, a work in progress. But I thought you might like to see what I’m cooking up. On the writing front, I’m in the process of editing a book about Wicca that I wrote nearly 10 years ago now, but then Life happened and I forgot to do anything with it. Michael reminded me about it, so now it will see the light of day! 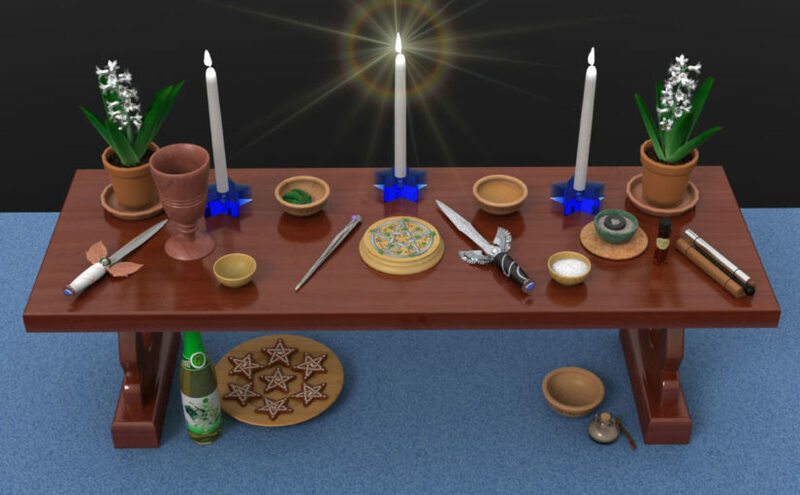 It’s for people who aren’t necessarily interested in joining the religion at all, but who want to know something about it because they have friends, neighbors, or clients that are Wiccan. With any luck, that will be available in the next month or so. The next Kip Andrews story will be published here on my blog on Saturday. I hope you like it. If you liked the last one (Stormy Weather) I’d really appreciate it if you could review it on Amazon. If you want to read it again, you can read it for free if you happen to subscribe to KindleUnlimited. Otherwise, the book is only 99¢. If you want to read my stories early, you can join my Patreon. I would really appreciate your support. I’m also starting to work on the redesign of the site, in my copious free time. (Haha.) Since there’s not a whole lot of free time, it might be a while before you can see it, but I’m working on it. So, that’s what I’m up to at the moment! Thanks for reading, and if you have a question, comment or suggestion, please let me know. 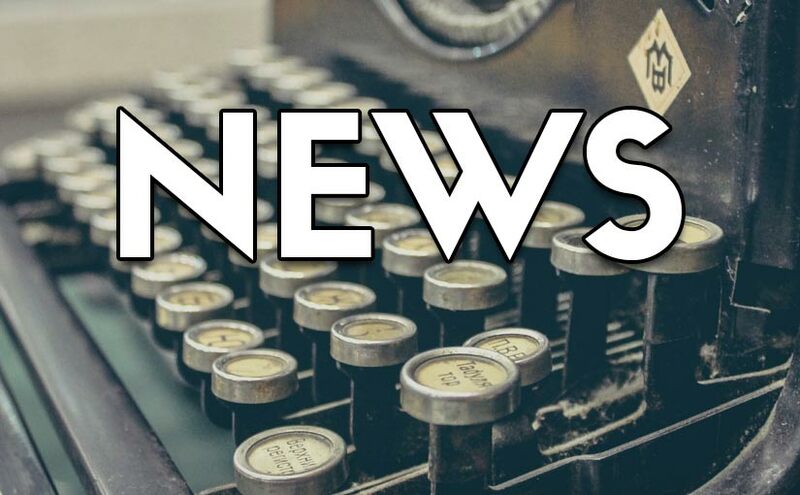 Posted on June 16, 2016 Categories News, Second LifeTags Arcade, News, Second Life, SL, writingLeave a comment on News – Second Life, Writing, and More! The June 2016 round of The Arcade in Second Life is open! This round, I have a pressed wood dollhouse, complete with all the furnishings! All the furniture is very detailed, and some of it, like the kitchen table and chairs, is designed to be easy to tint whatever color you like! 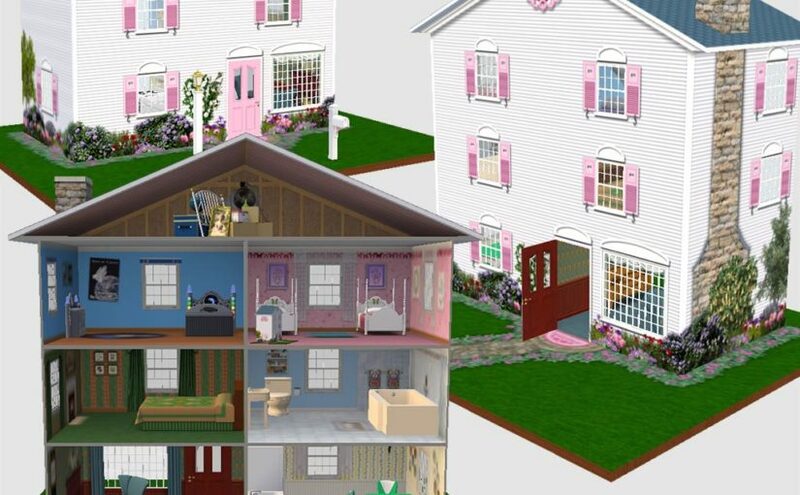 There’s even a dollhouse to go inside the dollhouse. 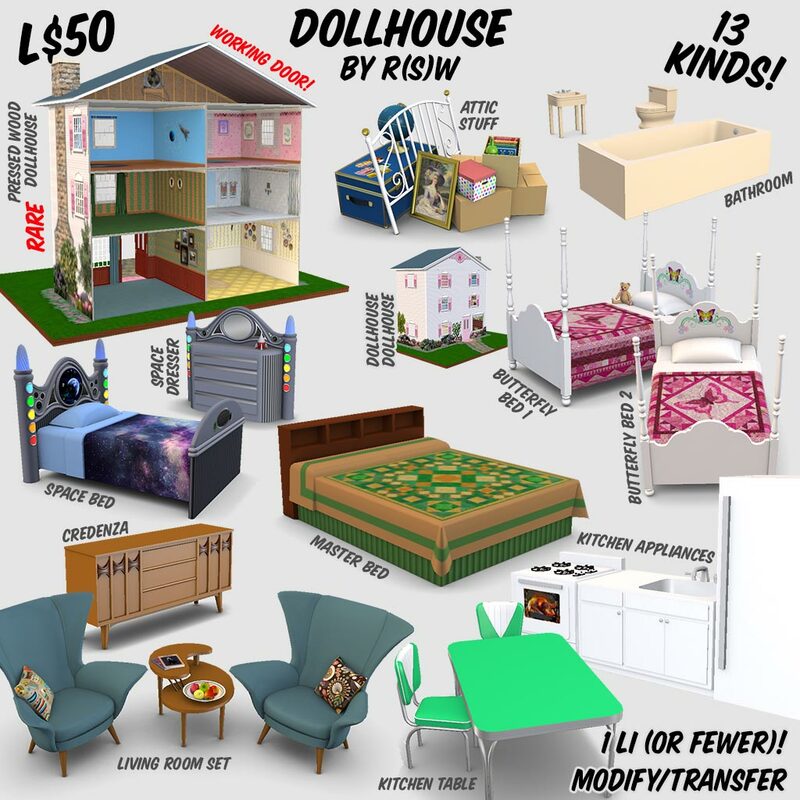 The dollhouse itself is carefully textured to show all the parts of the rooms that aren’t removable furniture; things like posters on the walls, a kitty clock in the kitchen, fireplaces, and kitchen cabinets. The outside has a richly landscaped texture, like a real pressed wood or metal dollhouse. The Arcade has a new “thing” this round; if you play the machine more than 50 times, you’ll get a special Reward. It’s only available for this one month. It’s no-transfer, so you won’t be able to buy them anywhere, and we have all agreed not ever to sell them anywhere else. 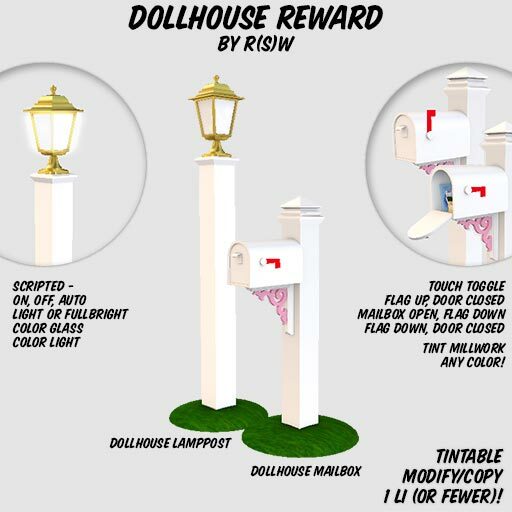 My Reward is a mailbox and lamppost for the dollhouse. The lamppost lights up, of course, and you can also change the color of the light, make it auto (on at dusk, off at dawn) and all the other things you can do with my lights. The mailbox has a toggle. The first time you touch it, the flag goes up. The next time, the flag goes down, and the door opens so you can see the tiny little pieces of mail. The third time, the door closes, and it’s back where you started. As always, I’m pretty excited about The Arcade. There’s a lot of really good stuff in it! You can see all of it (not just mine) at The Arcade June 2016 Shopping Guide. 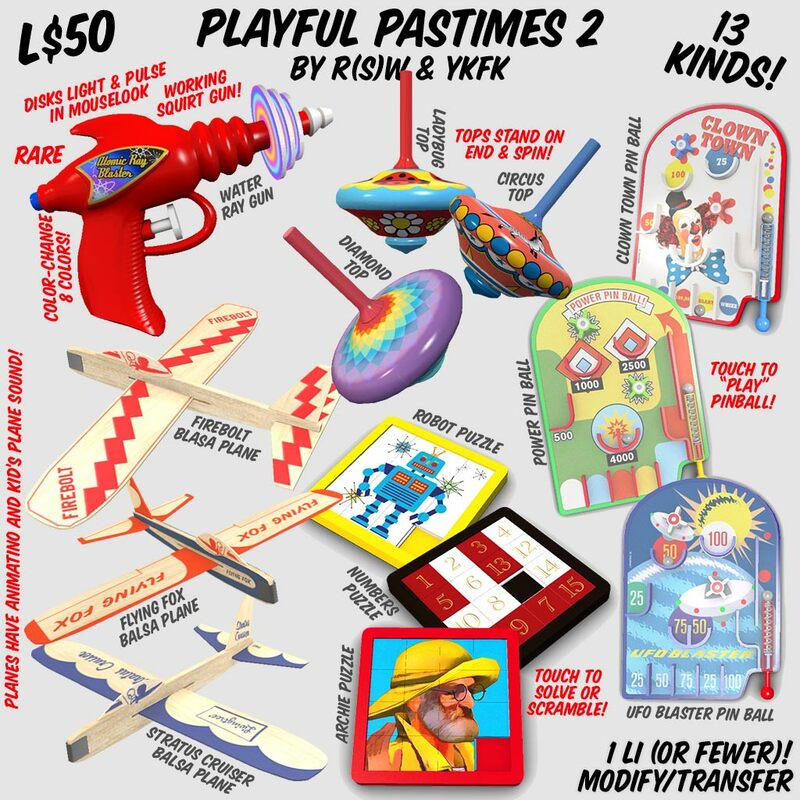 If you’re an SL Resident, it’s a lot of fun, and a great way to get amazing stuff for very few Lindens! 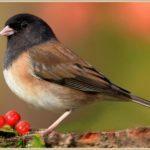 Posted on June 1, 2016 Categories News, Second LifeTags Arcade, Gacha, News, Second Life, SLLeave a comment on June Arcade! 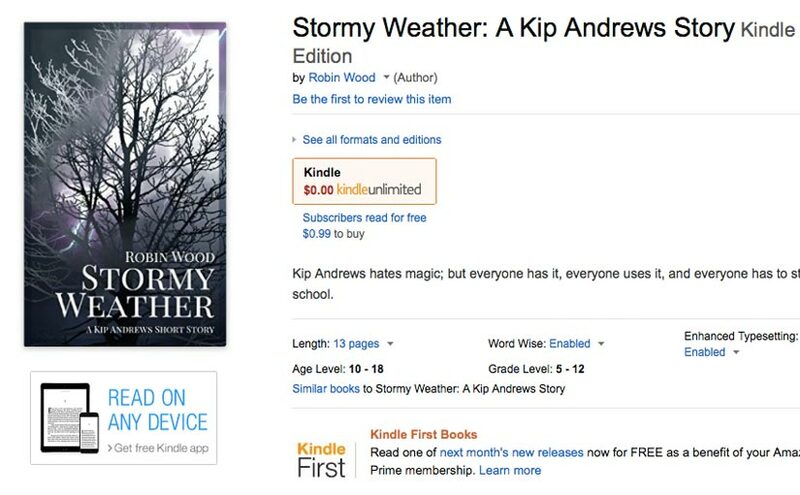 I got Stormy Weather made into a Kindle book yesterday, and today it’s up for sale on Amazon! If you’re a member of KindleUnlimited you can read it for free. If not, I’m afraid it’ll cost 99¢. Amazon won’t accept a lower price. I’d like to thank everyone who read it here, and encouraged me. If you liked it, and you can leave a review, that would be great! Good reviews really help. If you’d like to read any of the 3 stories that are still here, while they’re still free, you can find links to them below. As planned, I’ve bitten the proverbial bullet, and posted a page on Patreon. If you’re enjoying my stories, it would be great if you could help support me by becoming one of my Patrons. In case you’re not familiar with Patreon, it allows people who enjoy the work of various artists to give them donations in support of that work. It’s one of the reasons why many creative people no longer have to have a “day job” and can, instead, use their time to make the wonderful things that people enjoy. In my case, if you choose to support me, Patreon will bill you once a month, for whatever amount you have pledged. You can pledge as little as a dollar, because every bit helps. If you do, you’ll be able to interact with me on the special Patreon member page, and you’ll also be able to read the stories the day before I post them here. 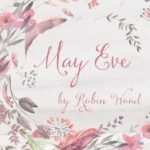 If you can pledge $3 or more, you’ll be able to read the story that will be posted on June 4 right now! (It’s another Grandnana one.) You’ll always get the stories 2 weeks early, as my thanks. For $5 a month or more, you’ll get the Kip Andrews story scheduled for June 18 right away. You’ll always be able to read all the stories a month early. For $25 a month or more, you’ll also get to see what I’ve written each day. I’ll post it, as raw and terrible as it comes out, at the end of the day. (Most days. Some days I don’t write anything, because of Reasons.) Whatever it is will probably change some before it’s printed. It might change beyond recognition, and I might just dump the entire project. It’s also going to be short stories some days, and a couple thousand words from a novel other days. It’ll vary, and it’ll be raw, but that’s the fun of it! I usually don’t show that to anyone but my husband, but if you’re willing to support me at this level, I’m willing to let you look. (You don’t have to read it, if you’d rather not.) You’ll even be able to leave me comments on it! For $50 a month or more, I’ll put your name in a special Acknowledgements section, on any finished novels or collections of short stories. You’ll also get all the things above, or course. So that’s that. The stories are up, and ready to be read this minute. There’s not a video intro (yet) but all my prospective Patrons are readers, so you’re not afraid to read, right? The rewards and goals are on the right side, when you go to the page. I really hope that you decide to become one of my Patrons; but if you don’t, I fully understand. The short stories will continue to be posted here, every other Saturday, as usual.